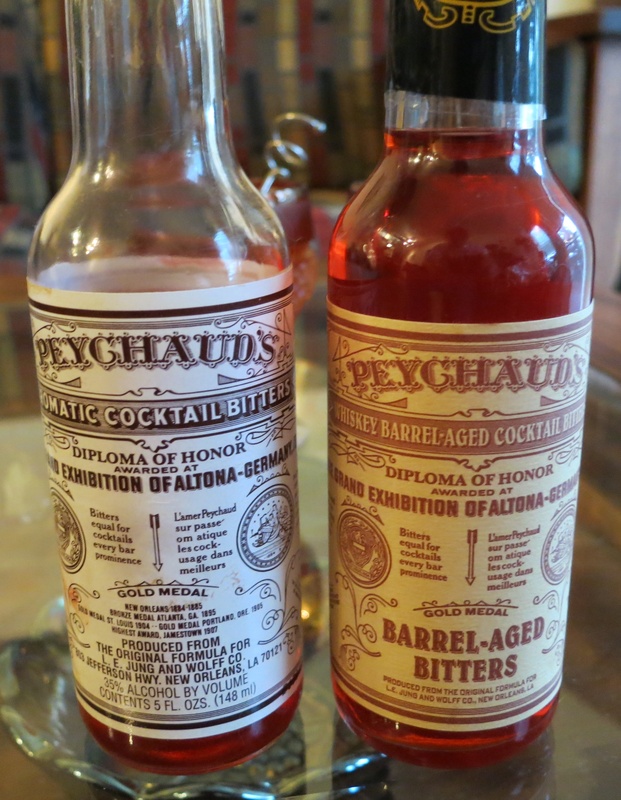 Way back in July, at Tales of Cocktail, we acquired some barrel aged Peychaud’s bitters. One of the (many!) nice things about Tales is that there were a lot of bitters to take a look at and we were able to try a bunch of them. 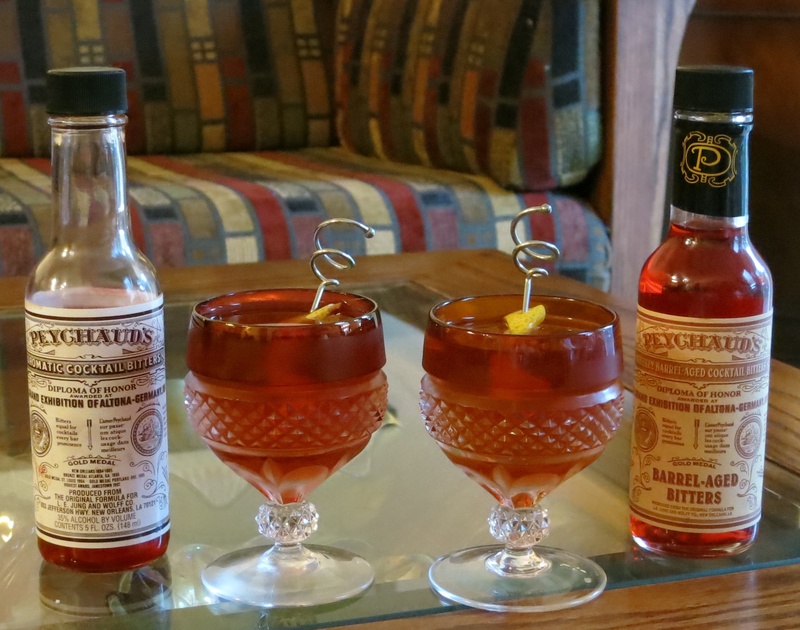 The barrel aged Peychaud’s were quite interesting; the same basic structure as the regular Peychaud’s was there, but some flavors were more muted while others were more pronounced. Given those differences, we decided to see how it affected a cocktail. Of course the classic Peychaud’s cocktail is the Sazerac. Otherwise known as a big glass of booze :D. Since the ingredient list is rather restrained, it’s a perfect cocktail for comparing exactly how one ingredient affects the final flavor profile. Tasting them on their own, the barrel aged is less bitter and more oaky/spicy whereas the regular Peychaud’s has more bitterness and vegetal/earthy notes. With those differences in mind, on to the cocktail! Rinse glass with absinthe. Pour other ingredients into a mixing glass. Stir with ice. Strain into a glass. Garnish with a lemon twist. Enjoy! Nose: Licorice, sweet barrel notes, lemon, really strong rye spice, a little bit of cherry. Palate: Earthy, woody, slightly musty on the front. Hints of cherry and licorice going into the mid-palate, then dark rye spice like toasted baking spices. Bitter, quinine-y bark notes on the finish moves into an aftertaste like unsweetened root beer. Nose: Similar to the regular, but the rye spice and barrel notes are stronger, the licorice notes are more muted, and the cherry notes are absent. Palate: Sweeter from the start, like lightly caramelized sugar. Slightly more pronounced licorice on the front (not indicated by the nose) as well as a touch of lemon peel. More and brighter baking spices on the intro and on the mid-palate. The finish is not as bitter, and the aftertaste is similar but not as clearly like root beer, more generally sweet and oaky. Overall a little bit sweeter and spicier, lacking the earthy and bitter flavors of the regular Peychaud’s. There you have it. Both cocktails are quite tasty, but with noticeable differences. Yet again, a great example of how a small ingredient can have a big impact on the final drink. Plus a good excuse to drink some yummy Sazeracs. Until next time, cheers! 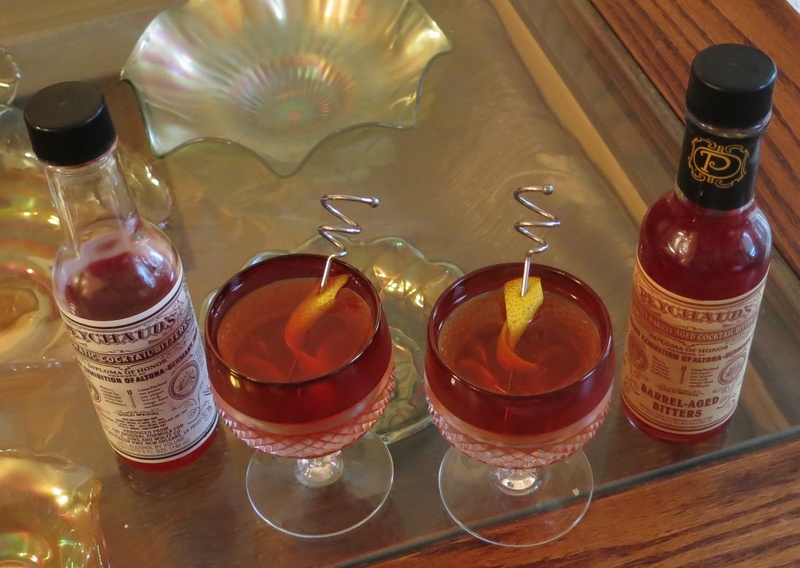 This entry was posted in absinthe, Cocktail Comparisons, peychauds bitters, rye, simple syrup, Tasting Notes and tagged sazerac cocktail recipe. Bookmark the permalink.